Hundreds of millions of patients are affected by chronic diseases globally, often suffering from several of them. Despite such a huge opportunity, the coverage of chronic conditions with digital solutions is still below the acceptable level. Each of more than twenty common chronic conditions has its own specificity and is currently at its digital development stage. Yet all of them face the same challenges in the digital market. We have identified at least ten major barriers that hinder the development of successful digital ecosystems for management of chronic diseases. Below we analyze them and offer possible solutions. The digitalization of chronic diseases is very uneven. Of more than two dozen of chronic conditions, only a few – diabetes, hypertension, asthma, COPD, and depression – have developed ecosystems of mobile app disease management solutions for patients and healthcare professionals. But even within this range the progress varies: at this point in time, only diabetes features a reasonably developed device-agnostic ecosystem of mobile management solutions with established user databases and consumerized offerings (Explore the new “Digital Diabetes Care Market 2018-2022: Ready To Take Off” report). Lack of consumer appeal: All chronic conditions, apart from digital diabetes, still lack the consumer focus in digital offerings. The main goal of the consumer-oriented approach is to provide and promote a solution that empowers patients to better manage their disease. However, many existing digital disease management solutions are still designed as medical rather than consumer apps, which makes them less interesting to patients. Digital solution providers should create offerings which appeal to the consumer side of the patient and offers lifestyle options to manage chronic deceases. Several diabetes solutions, such as OneDrop and mySugr, have already managed to get it right. Low added value: The existing chronic disease apps often create little added value for end users. Most of the currently available solutions offer either basic educational advice or simple tracking based on manual or automated data input. They leave behind the scope the whole range of potential consumer-oriented services, such as coaching services, behavioral change features, personalized recommendations, etc. On top of that, many publishers still do not sufficiently leverage the available technology, often ignoring connectivity advantages and/or artificial intelligence opportunities. To tackle this challenge, solution providers should increase value-to-patient by adding useful extra-features and services. Missing business models for consumers and payers: In the digital health market, payer organizations are now pushing digital services to their member base. However, in the majority of chronic conditions the reimbursement of digital services is still an issue. Apart from the digital diabetes market, consumer bundle subscription offers or payer models (implemented on the pay-per-member-per-month basis) hardly exist. Digital solution providers should pay more attention to creating reimbursement-oriented packages, which can potentially bundle services, digital content, medical products and accessories. Insufficient cost-saving evidence for payers: There are many clinical studies across all major chronic conditions that have generated evidence to support efficiency and efficacy of digital solutions in assisting chronic disease patients. What is currently missing is the link to cost savings, which hinders a larger engagement of payer organizations. As a result, the reimbursement market for digital chronic condition solutions is developing slowly, whereas the “out-of-the pocket” consumer demand is still rather limited. As a response to this problem, along with clinical evidence solution providers should develop sound cost-saving cases to address payers. Unfavorable demographic and behavioral characteristics of patient populations: Patient population characteristics can have significant implications for digitalizing disease management. Some chronic conditions, such as cystic fibrosis, are characteristic of young, proactive, and technically savvy patient demographics, whereas others, such as COPD and hypertension, tackle geriatric and thus often passive population. In asthma, the poorest adherence is demonstrated by younger sub-populations, especially adolescents. Solution providers have to find appropriate strategies to increase patient control despite these demographic and behavioral barriers. The development of caregiver solutions is one of the possible responses to this problem. Currently, nearly all of the available solutions are designed for patients or doctors, whereas the role of caregivers in patient management is still underestimated. Non-regular use of digital solutions: Chronic conditions are rather different in terms of usage regularity. For example, it is much easier to establish a daily use of digital diabetes solutions than that of asthma management apps, since asthma does not demand patients to make daily measurements. In weight-loss programs, patients measure weight or blood sugar level daily, also supporting the daily use of the related digital service. On the contrary, COPD patients measure lung function only once in several months. 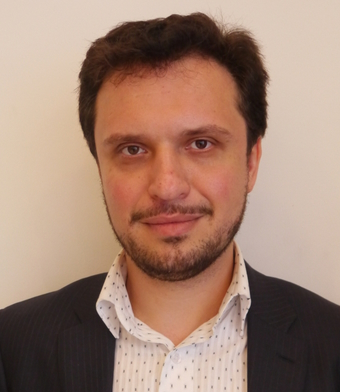 In conditions with a limited necessity of regular measurements, the creation of passive monitoring solutions, such as wearable-based measurements, could be one of the means to ensure a constant use of digital solutions. Low connectivity level: Although the use of digital apps in managing chronic conditions is increasing, it is not accompanied by a significant growth in the use of connected medical devices, such as blood glucose meters, spirometers, blood pressure meters, etc. In 2018, only 2% of the global diabetes patients and less than 0.1% of asthma and COPD patients used connected devices in managing their conditions. The usage of fitness trackers and smartwatches is higher; yet these wearables do not offer sufficient functionality for managing chronic conditions. In order to facilitate the growth of connectivity, app solution providers should create device-agnostic solutions that can be connected to multiple medical devices and/or wearables. This process is gaining momentum in the digital diabetes where some solutions, such as Glooko, allow more than 50 different devices to be connected to the service/app. Low communication support between medical professionals and patients: Communication between healthcare professionals and patients is seen as the most valuable feature within digital health solutions to drive user engagement and retention . Current digital respiratory solutions offer population management features for HCPs or PDF report generation but do not support direct HCP-patient interaction via chat, email or video call. Some providers, however, have introduced quite successful interactive services, which offer doctor consultations (a diabetes management service BeatO, India), support by certified diabetes coaches (Omada Health) or by certified dieticians (Oviva). Dependency on slow regulatory processes: Many digital disease management solutions are treated as medical devices under local regulations, if they include regulated components, such as devices and/or medical products. To avoid extensively long time-to-market, services and/or connected devices can be split into regulated (such as a bolus calculator in diabetes solutions) and a non-regulated (such as behaviour change features) components. 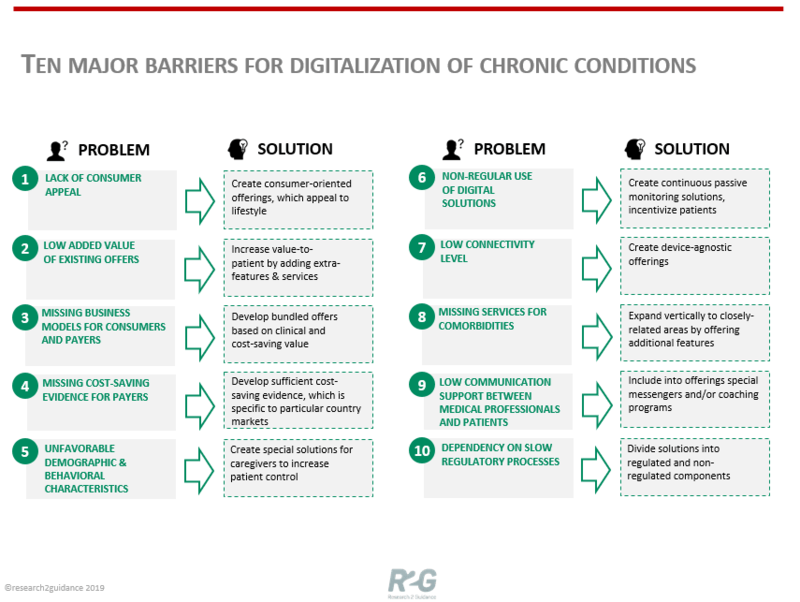 Overcoming these barriers is the prerequisite for the success of digital solutions designed for managing chronic conditions. The market has already seen several successful cases when digital solution providers went beyond the obstacles that were perceived as “natural”. By using the 3C-strategy (Consumerization, Connectivity, Cost-saving), the digital solution providers will definitely be able to get through to broader swathes of patients and payers.